POPULATION: 1027 GAMES, 287 GOALS, 429 ASSISTS & 716 POINTS DURING REGULAR SEASON – A NONPROFIT FANSITE | Jason Pominville of the Buffalo Sabres. A non-profit fansite. Jason was born on november 30th 1982 in Repentigny, Quebec to former minor league goaltender Jean-Marie Pominville, and a american mother. Jason is now married to his longtime girlfriend with whom he now boasts about two new family trophies, one of each kind. He has yet to be assisted by a goalie for an NHL goal. 1995: Played for Repentigny at the Quebec International Pee-Wee Tournament. (rive-nord elites) in the Quebec International Pee-Wee Tournament. Was a teammate there with Pascal LeClaire and at least nowadays longtime friend Yanick Lehoux. 1997/98: Drafted 57th overall by the Shawinigan Cataractes in the QMJHL Entry Draft after making his debut for the Cap-de-la-Madeleine Estacades of the Quebec Midget AAA league. 1998/99: Won the QMAAA championship and finished 6th in the league in assists. Played in first two QMJHL games at age 16 for the Shawinigan Cataractes. 1999/00: Became a regular on the Shawinigan Cataractes and his teammates included the future NHL players Pascal Dupuis and Marc-André Bergeron. 2000/01: Enjoyed a breakthrough season in the QMJHL and finished 10th in QMJHL-scoring. Played in the CHL Top Prospects Game under the coaching of Don Cherry, playing with Jason Spezza and for the first time becoming a teammate of Derek Roy. In the summer Roy went on to be drafted 32nd and Pominville 55th overall in the NHL Entry Draft by the Buffalo Sabres. 2001/02: Selected to the CHL Third All-Star Team and QMJHL First All-Star Team. QMJHL Most Sportsmanlike Player. Finished 2nd in the league in goals and 7th in points. Led Shawinigan in goals, while finishing 2nd in assists and points. Future NHLers Radim Vrbata and Zbynek Michalek came over to the Cataractes from the Czech Republic, and late bloomer Alexandre Burrows joined as well. An injury towards the end of the regular season caused Pominville to miss most of the playoffs. 2002/03: As a rookie in the AHL he finished 7th on the Rochester Americans with 34 points. Two other rookies on that Buffalo Sabres farm team was future longtime NHL teammates Ryan Miller and Paul Gaustad. 2003/04: Finished 4th in AHL goal-scoring and led the Americans in that department. Derek Roy joined the team from juniors. Pominville played in his first and for this season only NHL Game on Dec. 27 against the Washington Capitals. AHL Player of the Week Feb. 29. 2004/05: During an NHL lockout-strengthened AHL season he finished second in Rochester for goals, and third in assists and points. Thomas Vanek became a teammate. 2005/06: By scoring 19 goals in his first 18 games of the AHL season he was promoted to the Buffalo Sabres for good. As a rookie there he finished 88th in the league in goals per game amongst players who played at least 25 games. Scored his first career hat-trick at home against the Kings on january 14th. In the playoffs he added another one at home against the Flyers on april 24th, and then became the first player ever to clinch a series in overtime shorthanded, when he passed Daniel Alfredsson and scored on Ray Emery. The talented Sabres with a core of players like Daniel Briere, Chris Drury, Maxim Afinogenov, Teppo Numminen, Brian Campbell, Tim Connolly, Jochen Hecht, Ales Kotalik, J.P. Dumont, Derek Roy and rookies Pominville and Thomas Vanek reached all the way to the Conference finals, only falling to the eventual Stanley Cup champion Carolina Hurricanes. 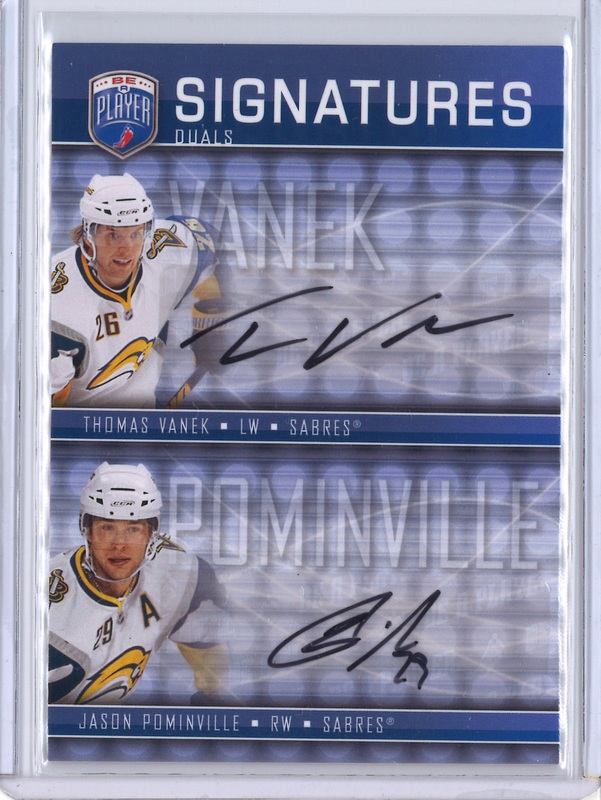 My 2010/11 Panini Dominion Peerless Patches. Piece of game-used jersey is from the 2005/06-season. 2006/07: Finished 26th in the NHL with a career high 34 goals, 2nd with 30 even-strength ones, and was 38th in Selke Trophy voting. On the Sabres, he finished 2nd in goals and 4th in points. At seasons end, Pominville and his team had reached their second straight Conference Final. My 2005/06 SP Authentic Sign of the Times Jochen Hecht auto. Between 2006 and 2012 Hecht came to get the distinction of being Pominville’s career most usual linemate at even strength. 2007/08: Finished 15th and 19th in assists and points with career highs of 53 and 80 respectively, 47th in goals. 10th in the league with 24 even-strength goals. Finalist for the Lady Byng Memorial Trophy, 9th in Right Wing All-Star Team voting and 35th in Selke Trophy voting. Finished 3rd on the Sabres in goals, 1st in assists and 2nd in points. When the team missed the playoffs he chose to represent his mothers country USA at the 2008 World Hockey Championships. The team lost in the quarterfinals against Finland. 2008/09: Finished 29th in the NHL in assists and 47th in points. 15th in Lady Byng Trophy voting. 50th in Selke Trophy voting. Finished 3rd on the Sabres in goals, 1st in assists and 2nd in points. 2009/10: Finished 49th in the NHL in points, 23rd in Lady Byng Trophy voting. Finished 3rd on the Sabres in goals, assists and points. Scored his third career hat-trick against the Lightning on march 18th. 2010/11: His iron streak of 335 games came to an end on October 13 due to a concussion he received two days earlier from an illegal hit by Niklas Hjalmarsson, who was suspended for it. Pommer finished the season with 22 goals and 52 points in 73 games and was 17th in Lady Byng Trophy voting. He finished 3rd on the Sabres in goals, 2nd in assists and and third in points. 2011/12: Finished 28th in the NHL in goals, 27th in assists and 19th in points. Played in 1st NHL All-Star Game. 8th in Lady Byng Trophy voting. Led the Sabres in goals, assists and points. 2012/13: During the lockout he chose to play with longtime friends Jochen Hecht and Yanick Lehoux for the Mannheim Eagles in the German first division. When the lockout ended he placed 57th in the NHL in goals and 54th in points. Was 8th in Lady Byng Trophy voting and 31th for the Selke Trophy. The season was abrupted by a trade to the Minnesota Wild on April 3rd, but his totals for the season would have put him 3rd on the Buffalo Sabres(Where he played the majority of the campaign) in goals, assists and points. With the Minnesota Wild he joined new teammates such as Zach Parise, Mikko Koivu, Ryan Suter, Dany Heatley, Jared Spurgeon, Niklas Backstrom, Charlie Coyle, Jonas Brodin, Mikael Granlund and Jason Zucker. This core of which many at this time was still inexperienced lost in the first round of the playoffs. 2013/14: Finished 16th in the NHL in goals, and 44th in points. 8th in Right Wing All-Star Team voting and 12th for the Lady Byng. NHL Player of the Week Nov. 4. Finished 1st on the Wild in goals and points, 4th in assists. In the playoffs the Wild reached the second round where they succumbed to the reigning Stanley Cup champion Chicago Blackhawks. Pommer had 2+7 in 13 games. Finished 53rd in the NHL in assists and 71th in points. 5th on the Wild in goals, 1st in assists and 2nd in points. In the playoffs the Wild again was eliminated by the eventual Stanley Cup champion Chicago Blackhawks, and Pommer finished second on the team in scoring on the strength of 3 goals and 3 assists in 10 games. Playing mostly on a line with Zach Parise and Mikael Granlund, Pominville’s season started with a career worst goal drought of 21 games. In all his 75 games he finished with a career low of 11 goals, adding 25 assists and 36 points. In the playoffs, while the Wild was eliminated in the first round in 6 games by the Dallas Stars, Pominville led the team with 4 goals and 7 points. Had somewhat of a statistical comeback year even though the deep Minnesota Wild prohibited him from receiving as much time on the power play as usual, his 40 even strength points up around where his career average stands. Finished with a total of 13 goals, 34 assists for 47 points in 78 games. Chosen league “Player of the Week” on February 13th. After the season he continued his annual streak of receiving votes for the Lady Byng Memorial Trophy when he finished in 8th place for the award. While the regular season can be seen as a place where individuals shine, playoffs is all about Team and therefore seasons here are ranked firstly by games played. This is perhaps what the scoring race of a league containing all NHL players since 1926/27 would look like. The formula is called VsX and presents players seven best seasons in points when compared to a benchmark number for each individual season. The %-column is an average of how the players stood up against those benchmarks. Obviously active players can still better their score. Jason Pominville of the Buffalo Sabres. A non-profit fansite.